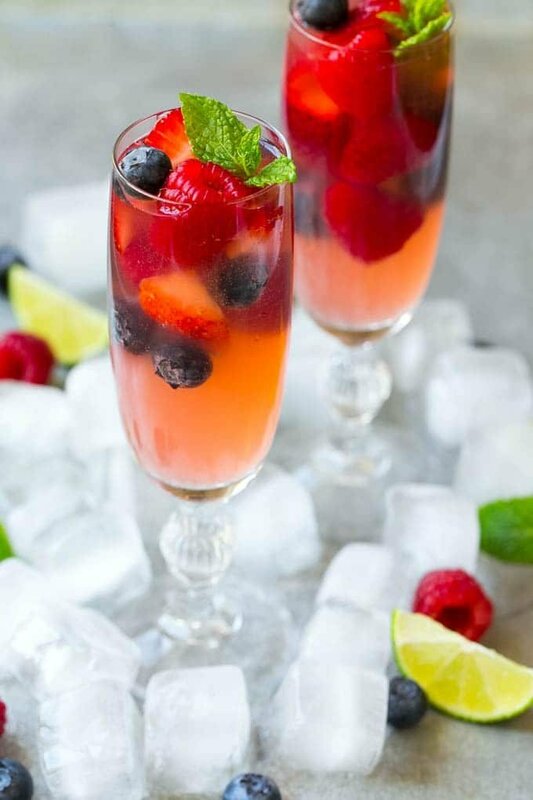 This berry champagne punch recipe is festive, refreshing and super easy to make! It’s the perfect cocktail for any summer party. I always serve at least one special drink at parties, it’s often pineapple punch, cherry limeade or this elegant champagne punch. Last week I found myself with a ton of berries on hand. I had pounds of strawberries, blueberries, blackberries and raspberries, plus buckets full of cherries from the trees in my yard. I was at a loss as to how to use them all, so I consulted a friend who is a talented cook and she shared her champagne punch recipe with me. Let me tell you, this is one of the best cocktails I’ve ever had. It’s the perfect combination of sweetness, fizz and fruit. This drink is perfect for any type of summer occasion, it’s definitely going on all of my brunch menus from now on. How do you make champagne punch? This recipe starts with champagne, which is combined with limeade concentrate and lemon lime soda. I used a random bottle of champagne that I happened to have in the pantry and it worked great. The pretty pink color comes from the berries. 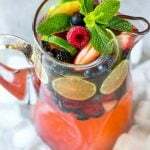 You can either use frozen berries which will naturally turn the drink pink, or if you prefer to use fresh berries you can muddle some of the berries at the bottom of the pitcher to get the same beautiful color. I went with fresh berries because I had so many on hand, but I’ve also made this champagne punch with frozen berries and it’s perfect that way too. The finishing touch for this drink is thinly sliced limes and fresh mint sprigs. Then simply pour into champagne flutes and serve! I love that this drink only takes about 5 minutes to make, and can be easily doubled or tripled if you’re serving a large crowd. So pour yourself a tall glass and say cheers to what will be your favorite drink of the summer! While I enjoy making this punch as written, sometimes I don’t have fresh berries on hand so I have to get a little creative and switch things up a bit! Tropical: Substitute tropical fruit such as pineapple, mango and kiwi for the berries. Citrus: Use a variety of sliced citrus such as lemon, lime, grapefruit and oranges instead of berries. 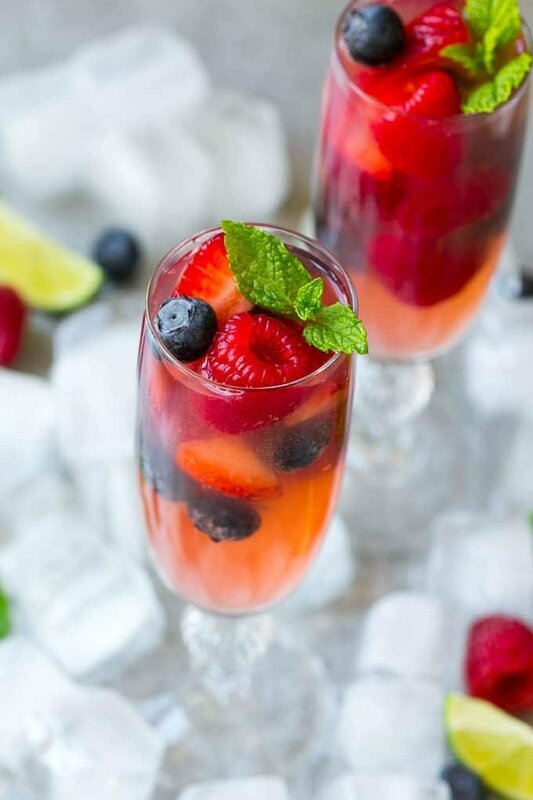 This berry champagne punch recipe is festive, refreshing and super easy to make! It's the perfect cocktail for any summer party. Pour the champagne, limeade and lemon lime soda into a pitcher; stir until thoroughly combined. 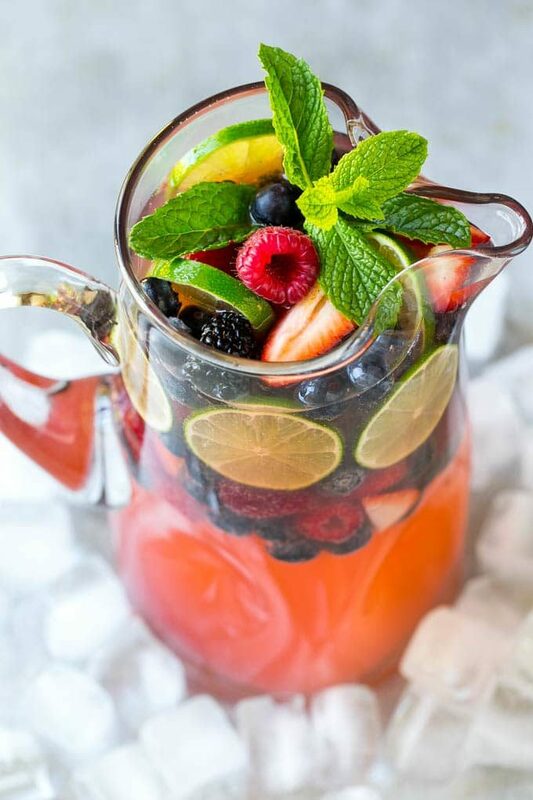 If using fresh fruit, muddle 1/2 cup of the berries at the bottom of the pitcher, then add the remaining berries. 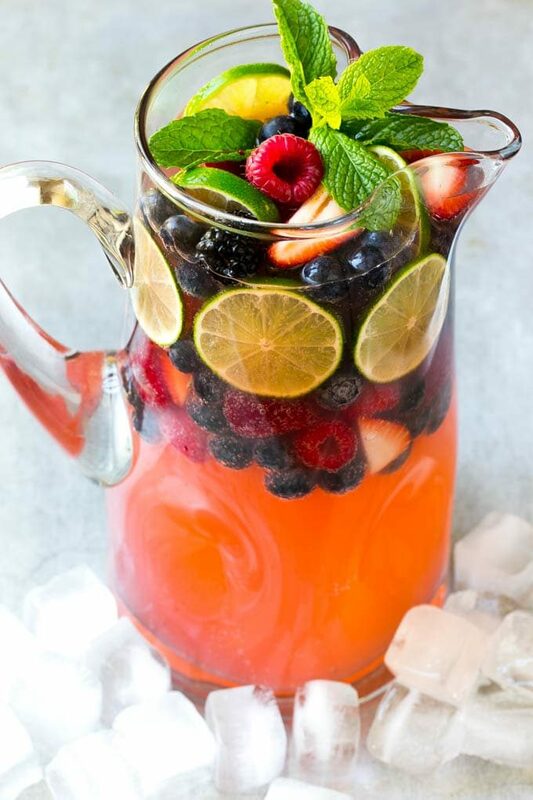 If using frozen fruit, simply pour the frozen berries into the pitcher. Add the sliced limes to the pitcher, and garnish with mint sprigs if desired. Serve immediately. It’s so hot here and this punch looks so refreshing! This flavorful punch looks absolutely amazing! Cannot wait to try it at our New Year’s Eve gathering! What kind of champagne do you recommend for this drink? Sweet, semi, or dry?